This short tutorial will show you how to recover files from your archives. Make sure you've had a look at the previous tutorial (Section 2 : "Running your first backup") before reading this section. Let's assume that you want to recover the very first version of "MyNewPicture.jpg" (see image below and tutorial section 2 : "Running your first backup"). Select it in the history (on the right side of the "Logical view" tab), right click and select "Recover ...". A new window appears and asks you where to recover the file. Enter the destination (for instance "/home/olivier") and hit "OK". That's it : your file has been recovered in "/home/olivier". As previously, a new window appears and asks where to recover the selected archive. Enter the destination (for instance "/home/olivier") and hit "OK". Note that in this case, Areca will recover your archive in a "rcv" subdirectory (in this example : "/home/olivier/rcv"). 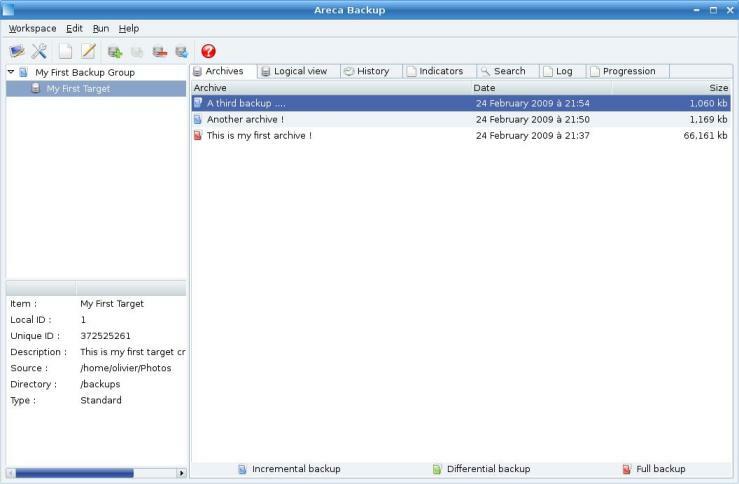 You can also notice that Areca recovers the "MyNewPicture.jpg" file that is contained in your third archive, but also the files stored in your previous archives : you don't have to recover your data archive-by-archive.